I’m a web/graphic designer and digital marketer. I love partnering with designers, writers, and creatives to build custom, responsive websites, email marketing campaigns, and even traditional print media. Currently, I’m all about building great looking mobile-friendly WordPress websites for small businesses that help them bring in more customers. I also have a background in traditional print design and layout and have designed and produced a wide range of items including table-top gaming books, catalogs, promotional mailers, trade show booth signage, print ads, and t-shirts, to name a few. This portfolio contains a sampling of the work I’ve done over the last 15+ years, but it’s by no means comprehensive. If you have any questions about specific projects I’ve worked on or the companies I’ve worked for, please contact me. 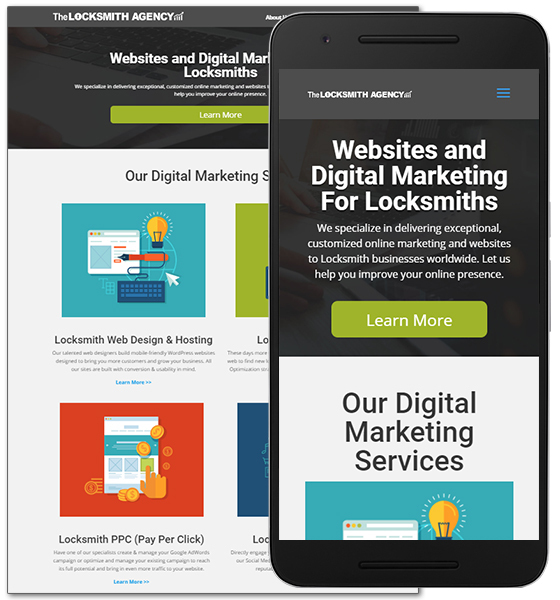 As the Lead Designer, I create great looking, mobile-friendly WordPress websites for small businesses. In addition to making each site fast and easy to use, I place a huge emphasis on highly relevant, customized site content and SEO strategies that boost local search rankings for each client. Higher local search rankings mean more traffic, more customers, and more business growth for these small businesses, and that’s just awesome stuff. Each site is custom built for the client and designed to help them dominate their local search results and grow their business. As the Web/Digital Marketing Specialist I created pages for, updated, and maintained the HamiltonBeach.com e-commerce site. I added and maintained several hundred product pages as well as inbound marketing content including articles, tutorials, infographics, and videos. As a part of the process I proofread and edited content. 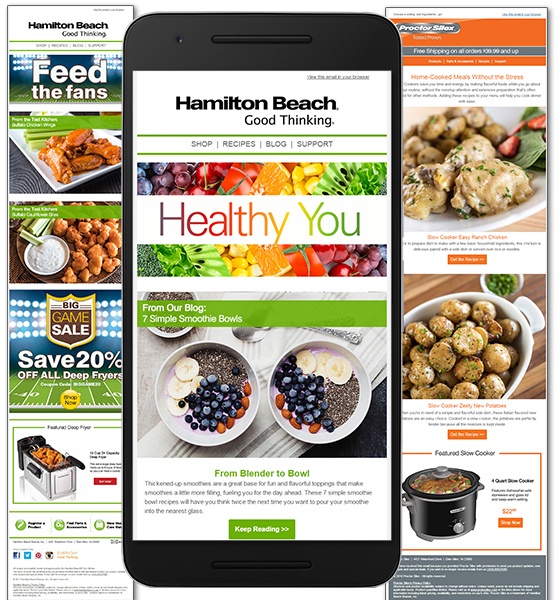 I collaborated with the Digital Marketing team to design and implement the complete redesign of HamiltonBeach.com twice in 4 years. The most recent mobile-first redesign was launched in Feb. 2017 and the previous responsive redesign launched in 2013. I took part in front-end site design, site map development, SEO strategy, and site-wide testing before and after launch. 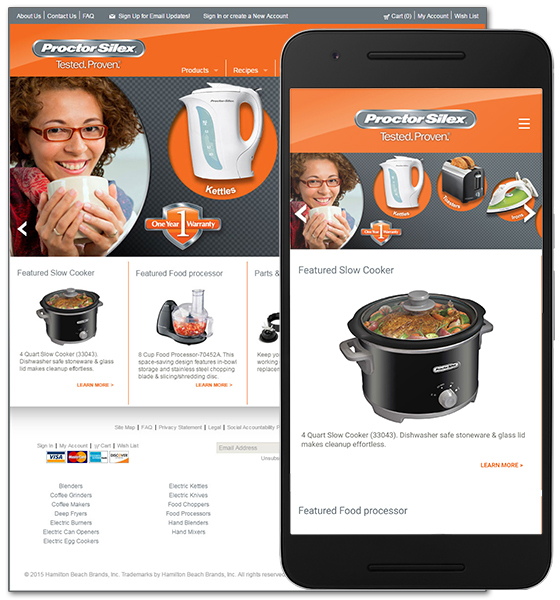 I designed, deployed, and managed email marketing programs for Hamilton Beach and Proctor Silex that doubled the email list, increased site traffic, and increased e-commerce sales. In 2016 we ramped up the email marketing program and I developed and deployed 122 emails to a list that had doubled during my time to over 100K subscribers. 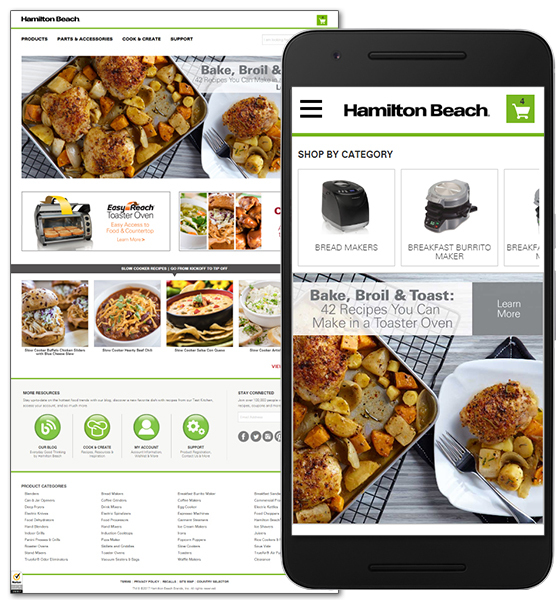 In 2015 Hamiton Beach launched a mobile-optimized redesign of the Proctor Silex site. I took part in all aspects of the redesigns including front-end site design, site map development, SEO strategy, and site-wide testing and QA before and after launch. As a member of the Creative team mine was a hybrid role that spanned the web and print departments. 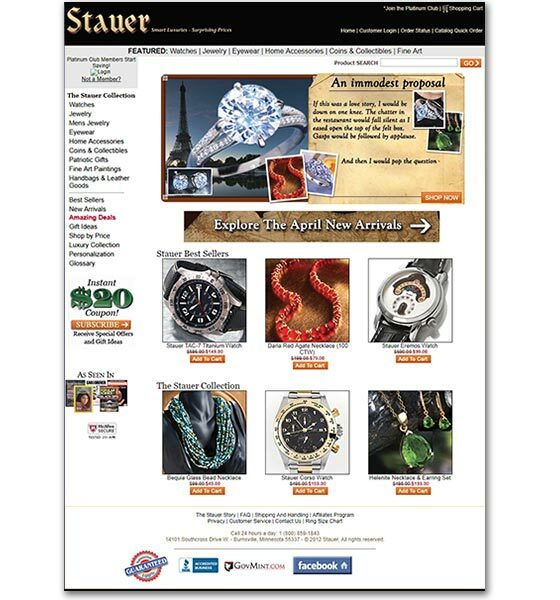 On the web side I maintained the front end of the Stauer.com site as well as design and create ad banners for our Ad Sales manager. On the print side I created and did the layout of catalogs, solo mailers, glossy product spec brochures for the top 20 products, watch instructions, advertising and sales collateral included in every shipment, print advertisements (for 1000s of publications), and coupons. As the Email Marketing Manager I designed and deployed HTML emails to multiple customer segments on a daily or 3x a week schedule. 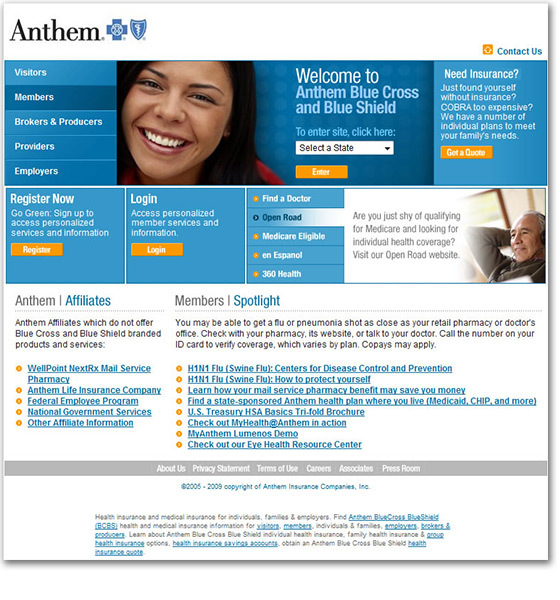 As a member of the eBusiness Content Coordination team I created pages for, updated and maintained www.anthem.com, www.unicare.com, www.empireblue.com, www.bcbsga.com, www.wellpointnextrx.com and many other corporate microsites within the Wellpoint brand family. 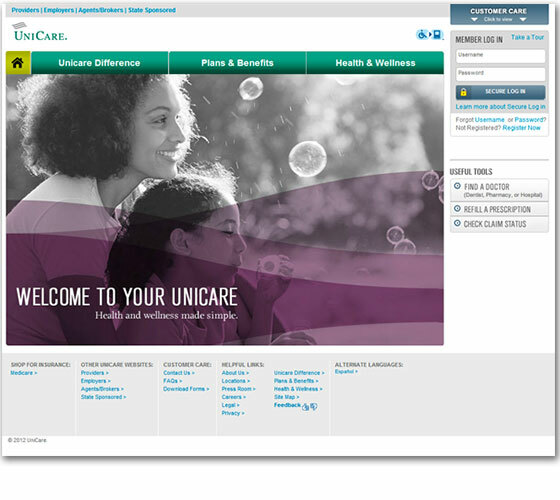 As a member of the eBusiness Content Coordination team I updated and maintained www.unicare.com, www.anthem.com, www.empireblue.com, www.bcbsga.com, www.wellpointnextrx.com and many other corporate microsites within the Wellpoint brand family. 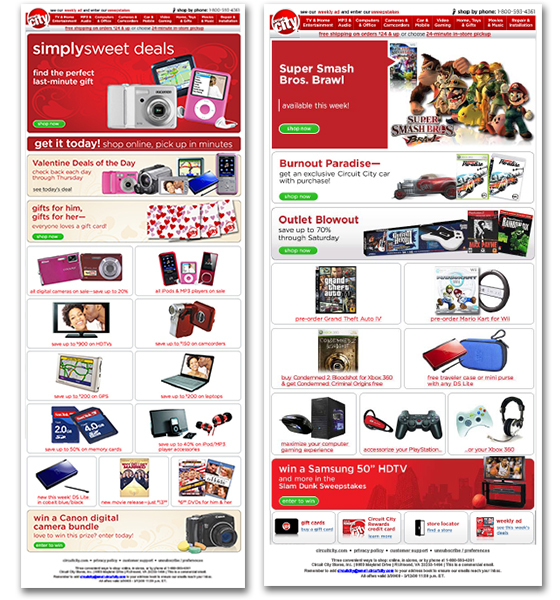 As part of a small team of copy editors and designers, I designed and coded targeted versions of Circuit City’s award-winning Thursday and Sunday HMTL marketing emails using Photoshop and Circuit City’s enterprise CMS. By “targeted” I mean that each email had 5 different versions, so each week I was creating 10 different emails: the default (and largest) version, movies and music, mobile, gaming and TV. These emails were viewed by millions of email campaign subscribers every week. 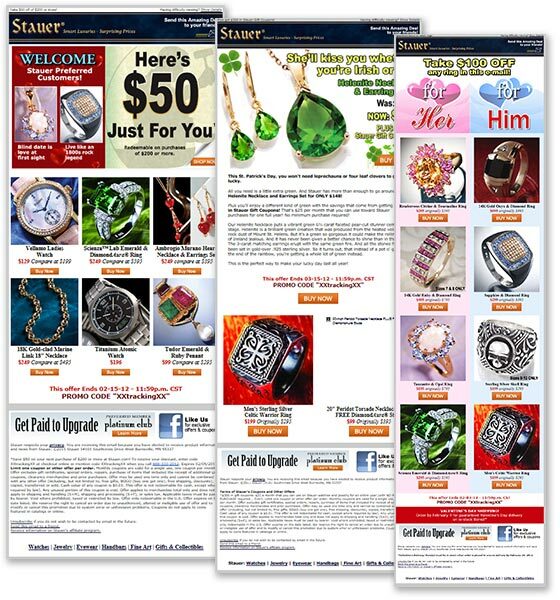 In addition to these twice-weekly ads I also created special weekly ads targeted to specific customers. 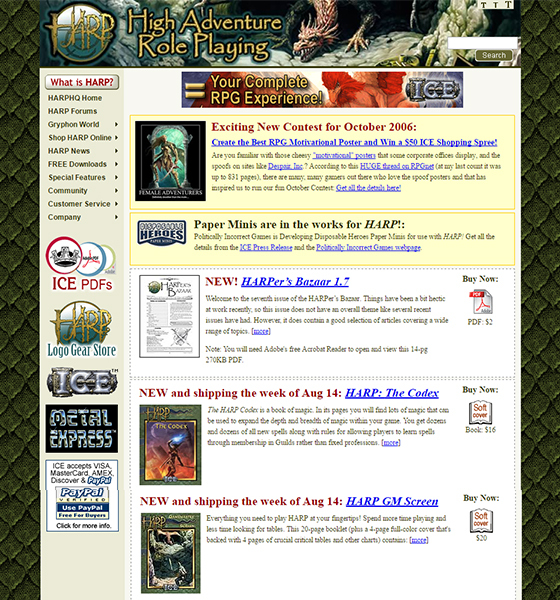 As ICE’s webmaster I designed, developed and maintained this site for ICE’s High Adventure Role Playing gaming system. It was one of the first few sites I built with a CSS-based layout. 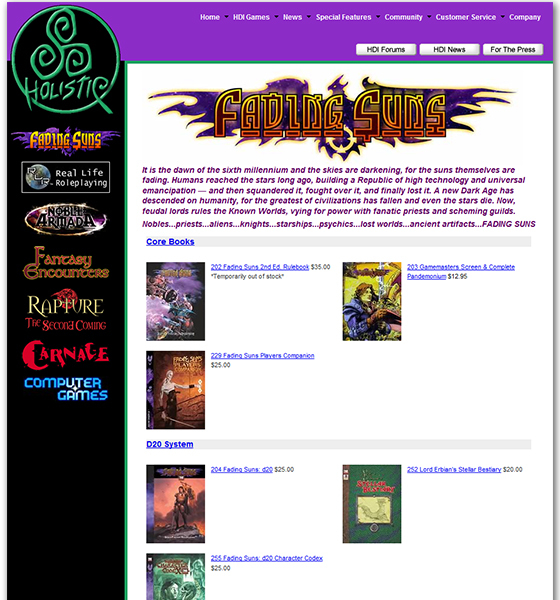 The folks at Holistic Design liked the redesign I did on the Iron Crown Enterprises site so they asked me to redesign of their RPG/table-top gaming site for them. This was a fun project that further honed my skills with CSS-based layouts. Their current site still uses my design so I guess they really like it! As ICE’s webmaster I designed and executed a complete redesign of the old ICE site that had been created in Microsoft Front Page. After teaching myself how to use CSS and Dreamweaver, I created this new site with a CSS-based layout. I completed the redesign in 2001 and continued to update and maintain the site through early 2007. This is the first corporate website I designed and built back in 1999. Creating this site really expanded my knowledge of HTML and also taught me to dislike FrontPage. 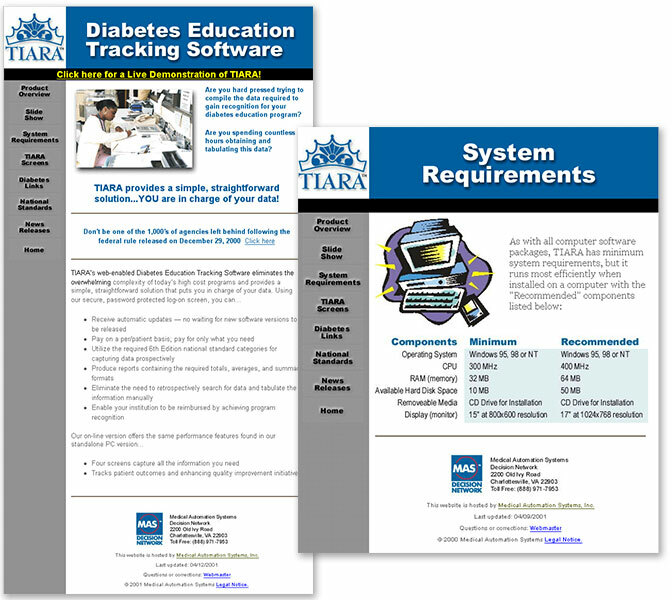 The site is a table-based layout but it served it’s purpose very well and Medical Automation Systems used it up through 2008. 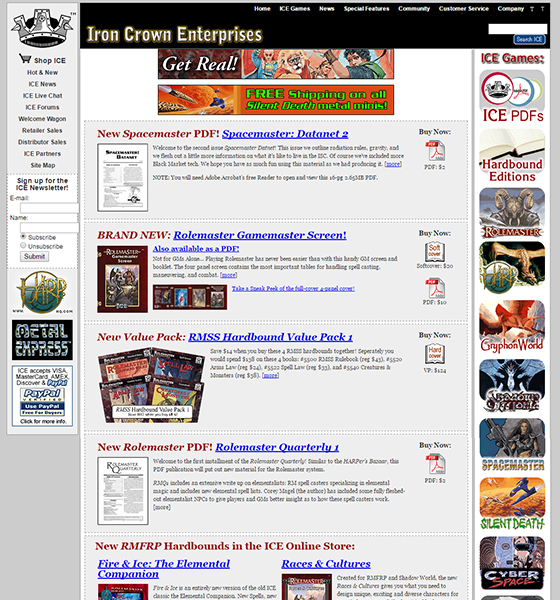 Prior to the wide-spread use of the internet, Iron Crown Enterprises advertised in a variety of consumer and trade gaming magazines. 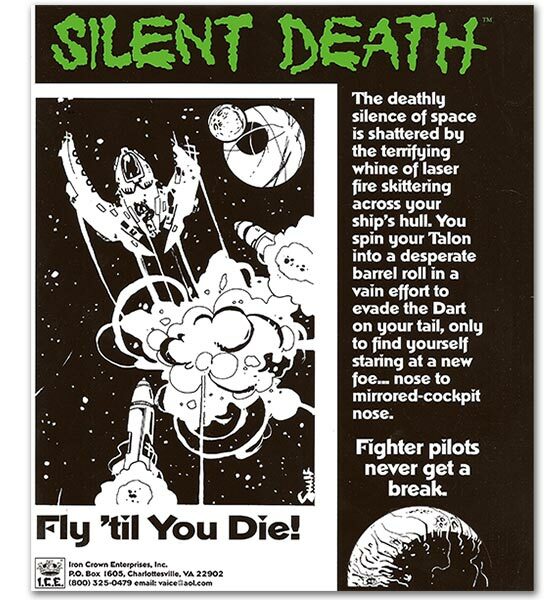 Silent Death is one of ICE’s most enduring and popular table-top games and this is one of the many print ads I created. I used Photoshop and PageMaker to make this one back in 1998. At the time, our art department used QuarkXPress to build the gaming books and other games, but I used PageMaker for all my projects. 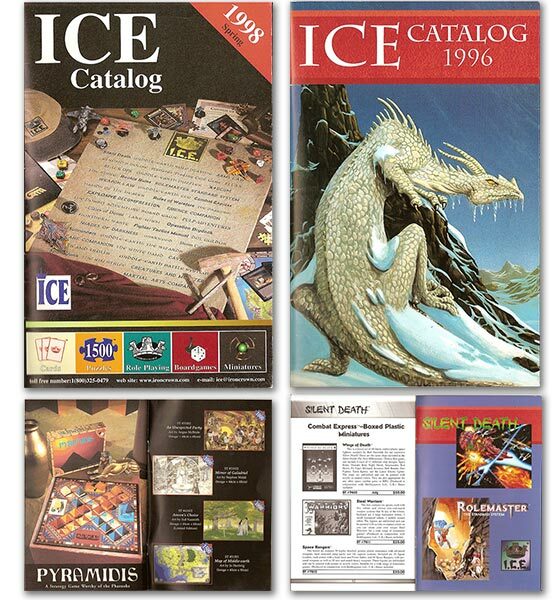 Back before ICE had a website we had a print catalog with full-color covers and black & white interiors. I used PageMaker for the interior layout and Photoshop and QuarkXpress for the color covers.